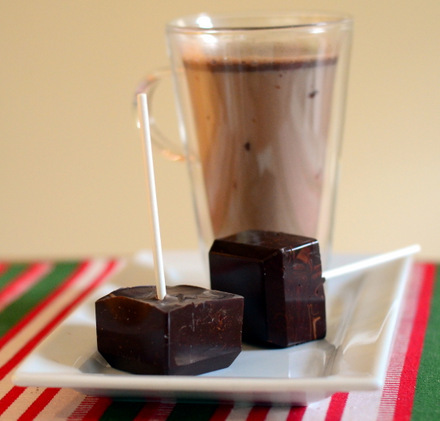 A hot peppermint mocha is an indulgent way to take off the chill on a cold winter night. I love the combination of chocolate and peppermint – and it is even better once you throw a little bit of coffee in to the mix! 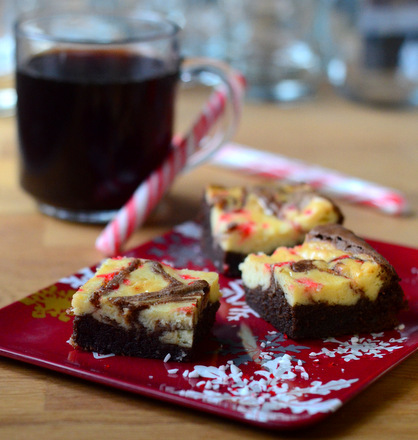 My Peppermint Mocha Cream Cheese Brownies are a holiday treat inspired by the hot coffee drink. They’re easy to make and just might become a new family favorite. The coffee flavor is all in the brownie layer. Instant coffee powder is an easy way to infuse coffee into the batter because it dissolves easily. If you prefer a stronger coffee flavor, you can use instant espresso powder or Starbucks Via. The coffee powder and the dark chocolate combine to give the brownies a rich mocha flavor. 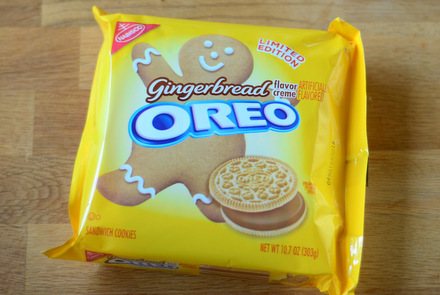 Frankly, they would be delicious on their own, but adding a cream cheese swirl makes them wonderfully decadent. I opted to only add peppermint to the cream cheese topping, since peppermint extract is very potent and I didn’t want it overwhelming the flavors in the brownie. With two layers of flavor, you get nice contrast in every bite and get the full peppermint mocha experience! Since these brownies have two layers, they take a bit longer to bake than other brownies. While it may be tempting to pull them out of the oven just as the cheesecake layer appears to be set, resist that temptation because the brownie base needs a little extra time. You can’t go wrong with a fudgy brownie – and these are fudgy! – but you don’t want the brownies to be too wet on the bottom because that will make the difficult to slice and pull out of the pan. I recommend chilling these before slicing. Stored in the refrigerator, they will keep well for several days after baking – if they last that long. Make the brownies: In a small, heatproof bowl, melt butter and chocolate together. Stir with a fork until very smooth. Stir in cocoa powder and instant coffee until dissolved. Set aside to cool slightly. In a large bowl, whisk together sugar, eggs and vanilla extract. Whisking steadily, pour chocolate mixture into sugar mixture. Stir until smooth. Add in flour and salt and stir until batter is smooth and well-combined. Pour into prepared pan and set aside while you prepare the cream cheese mixture. Make the cream cheese topping: Â In a medium bowl, beat cream cheese, sugar, egg, vanilla extract and peppermint extract until smooth. Drop in large dollops onto prepared brownie batter. Gently swirl two batters together with a butter knife. 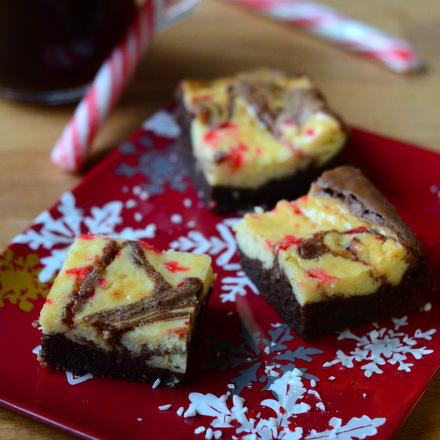 Sprinkle chopped candy canes over the top of the brownies. Bake for 40 minutes, until brownies and cheesecake are set and the topping is very lightly browned. A knife inserted into the cream cheese mixture should come out clean. Cool in the pan completely, then refrigerate before slicing and serving.